Google launched its new Social Networking service Google+ (not Google +1 button, thats entirely different) and it sent only some few invitations worldwide, Still we didn’t get yet and waiting for it. But We have gathered few news about Google+ from external site about the interface of the Google+. 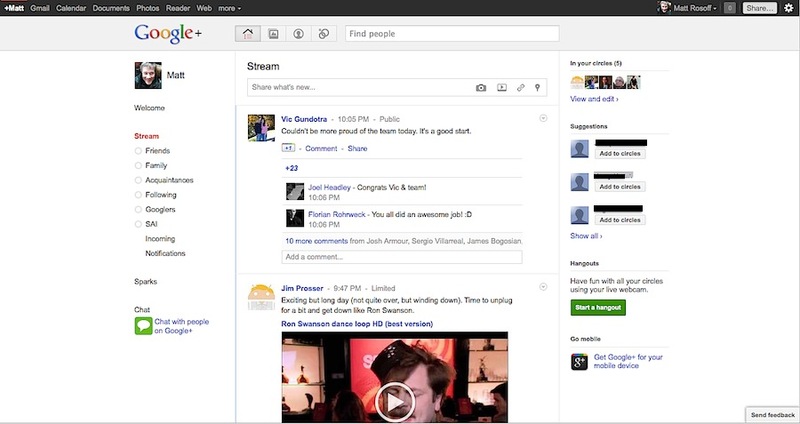 Google+ is just looks exactly like Facebook, it comes with with video chat. Its looks like they cloned Facebook as Google+. There are some difference is like adding friends to circle (in Facebook we call friends list). In the Profile page all the names shows as +name (Im “+Matt) in the above black Google bar its the main Google toolbar to access all the Google products in one place. and the steam is just like Facebook News Feed. You are quite common in updating facebook status, photos, links and videos as same Google+ allows user to share this things from the Stream and Google +1 button is used as Like button in Google+. You can see the above picture and spot the Suggesting People to others, it will remind you the facebook. We are still waiting for the invitation to access Google+, if we get one. Surely we will update about this more. Stay tuned. Still there is a hope to see it viral as gmail users will be able to use it without switching to other sites. Thanks for you comment kamal.. And even im stay with Facebook.